NABI Computational biology workshop 2018, focus on Plant Genome Analysis, genome assembly and annotation, Big-data mining, association genetics and computational biology etc. 12th, 13th and 14th March 2018 at National Agri-Food Biotechnology Institute (NABI), Mohali. 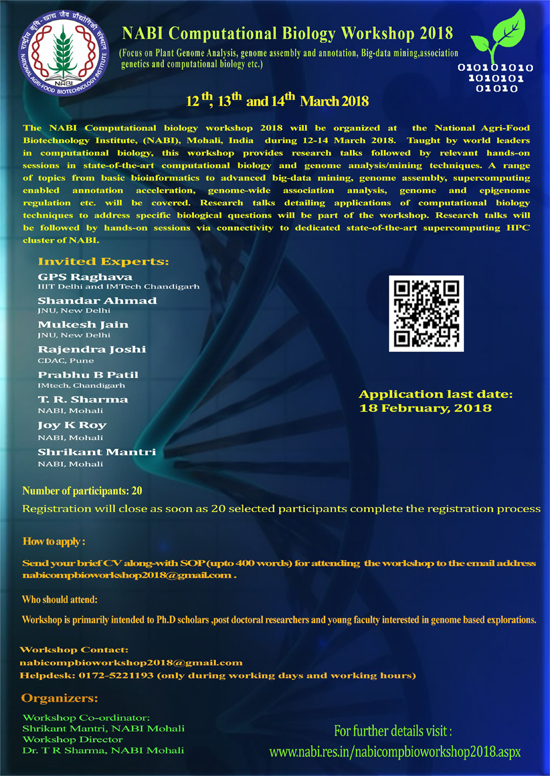 The NABI Computational biology workshop 2018 will be organized at the National Agri- Food Biotechnology Institute, (NABI), Mohali, India during 12-14 March 2018. Taught by world leaders in computational biology, this workshop provides research talks followed by relevant hands-on sessions in state-of-the-art computational biology and genome analysis/mining techniques. A range of topics from basic bioinformatics to advanced big-data mining, genome assembly, supercomputing enabled annotation acceleration, genome-wide association analysis, genome and epigenome regulation etc. will be covered. Research talks detailing applications of computational biology techniques to address specific biological questions will be part of the workshop. Research talks will be followed by hands-on sessions via connectivity to dedicated state-of-the-art supercomputing HPC cluster of NABI. Invited experts will be available (impromptu) during the workshop for consultation and advice to improve participants research project experiment design and analysis strategy. Workshop is primarily intended to Ph.D scholars and post doctoral researchers and young faculty interested in genome based explorations. Pre-requisites: Basic knowledge of Computers, Biology and Bioinformatics Must have: For hands-on sessions, portable computing device, preferably laptop. Send your brief CV along-with SOP (upto 400 words) for attending the workshop to the email address nabicompbioworkshop2018@gmail.com . (Includes registration fees, meals for the workshop days). Hostel accommodation on sharing basis will be available for the participants (on chargeable basis). Process to make payment will be communicated to selected participant via email separately.